There will always be chances of some kind of weather or geologic condition no matter where we live in. Say storms, strong winds, earthquakes, and even floods, these require our attention to rethink our home’s construction. In this case, the Philippines has been known to the world for the tragic experiences brought by typhoons that resulted to strong floods and countless casualties. Instead of looking at this as a problem, in one way or another, take this as an opportunity to protect your family through storm-proofing your home. Having adequate storm protection can make the difference between minimal storm damage and serious property loss. Hoping for good weather or waiting until the last minute puts you at a disadvantage. You should always remove yourself, and your family, from the path of an oncoming dangerous storm. Evacuate with confidence knowing your property is protected. Let the water flow.While you should always keep your gutters and downspouts clean, it’s particularly important to make sure nothing blocks flowing water during a storm. Let’s face it, the water will want to go somewhere. If it’s not down and away, it’ll be in your roof and attic. Conduct a visual inspection of your gutters and downspouts to be sure nothing blocks the flow of water from your roof to avoid water getting inside your precious home. Protect your doors and windows. Whether with impact-resistant glass or shutters, protecting doors and windows against high winds and flying debris is imperative because strong typhoon winds can throw objects away. Keep your landscape free of any debris.Prune trees and remove dead branches well before the any storm shows up. To avoid further damage and injuries, remove any patio furniture and other loose items outside that can get blown around. Safe and elevated location.Especially for houses in some coastal areas, building codes require that the structure be raised. While garages and storage spaces can be placed at the ground floors of these homes, the construction should be such that the structure doesn’t block a storm surge. As much as possible, location should also be considered when planning to put up a house. Coastal communities should be moved further away from the shoreline to lessen the risk of storm surges (flooding due to abnormal sea level rise). Keep basic supplies on hand. The power of a typhoon can be so damaging to the extent that it cannot be foreseen. So it is suggested to keep on hand at least a three-day supply of items such as candles, batteries, potable water, canned goods that don’t require refrigeration etc. Put together an emergency kit in advance of any storm as recommended by the National Disaster Risk Reduction and Management Council. 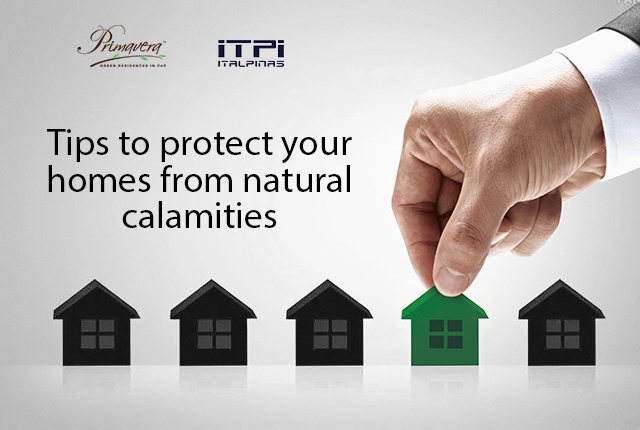 As advocates for calamity-resistant homes, Primavera Residences is designed to withstand strong earthquakes, typhoons, and other natural calamities, while its elevated location at 110 meters above sea level makes it flood-free and ideal for safe, hassle-free, and convenient eco-friendly living. Do you want to know more about the building’s tips and advocacies? Call 0917-794-2221 or visit its website here.